The Commons at Baxter & Love campus has hosted a great number of community gatherings for a series of different groups and participants, sports teams, musicians, and boy and girl scouts included. We have witnessed a lot of engaging activities during these gatherings, and today we would like to share with you a few tips on how to organize a fun boy and girl scout event to celebrate a successful fund-raiser campaign. Or maybe you have noticed your group of diligent and skilled scouts has grown a little tired and might need some re-energizing. There's nothing that a fun and engaging activity cannot heal. Here are some excellent game ideas well-suitable for children of all ages. For children ages 5 through 7, penny bingo is an excellent activity that will keep their spirits high and help them enjoy themselves. You will need to print out a few colorful bingo boards on a piece of paper. You can make things even more fun and ask players to bring their own contribution to the creation of the bingo cards. They can draw on them and use their favorite colors and cartoon characters or superheroes and have fun even before the game actually begins. Next, ask each of the players to sign their name on each bingo square. Then place their names in a hat and play the game just like you would using numbers instead of names. Cover the squares using pennies or candy. Children are prone to have a good time and bond better. Games like poker and blackjack might not be fitted for young kids. But they can still engage in a few miniature roulette games and slot machines. They can also flip cards and toss coins, or play dice games. One interesting game you could try is the Casino Go Fish game. Choose an adult dealer who will give each of the five players five cards. The remaining cards in the deck will be placed in the middle of a table, together with the chips. The aim of the game is for each player to collect groups of four of the same card. 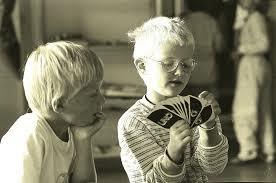 They can ask other players for missing cards, or go fish the cards they need from the pile on the table. They will also have to take a poker chip every time they will use one of the extra cards. The player who manages to get rid of all of his cards and gather the smallest number of chips will be the winner. You could also try the "Beat the Dealer" game, where children will try to guess whether the cards will be higher or lower than the preceding ones. Aces are the highest cards here, and the adult dealer will flip over one card and let children make their guess. The game will end when the guesses will be wrong, and the winner will be the player who will make most correct guesses in a row. If you haven't set foot inside a land casino for ages, you can refresh your memory and play real money casinos online to get a better insight into the games you could choose from. If you are having trouble remembering basic rules for a game, or you would simply like to get acquainted with the latest titles, Australia Casino is a good place to start. You will find out what are the best online bonuses offered by the best casinos online for the current month, including high roller or VIP bonuses, no deposit or payment method bonuses, welcome, tournament, or friend referral bonuses and more. The site also introduces visitors to a detailed game presentation, including associated bonuses for each game category and useful tips for new players and loyal ones. Whether you are interested in baccarat, bingo, craps, blackjack, video slots, pokies, poker, or roulette, you will find the information you are looking for. Plus, the site constantly updates its news section with the latest titles on game or casino releases, spectacular promotions and bonuses worth looking into, and the latest lucky winners. The freeze dance or the cake walk are other fun games you could consider organizing at your upcoming boy and girl scout party or event. You can also consider setting up a nature hunt event, or install some laser beam streamers in a room and engage players in a fun game in which they will have to reach the opposite side of a room without letting the laser beams touch them.